While the owners of Atelier360 -- an independent clothing and accessory store in Greenwich -- take pride in a strong understanding of fashion, it's a conscious commitment to their unique selection of vendors that makes them different. 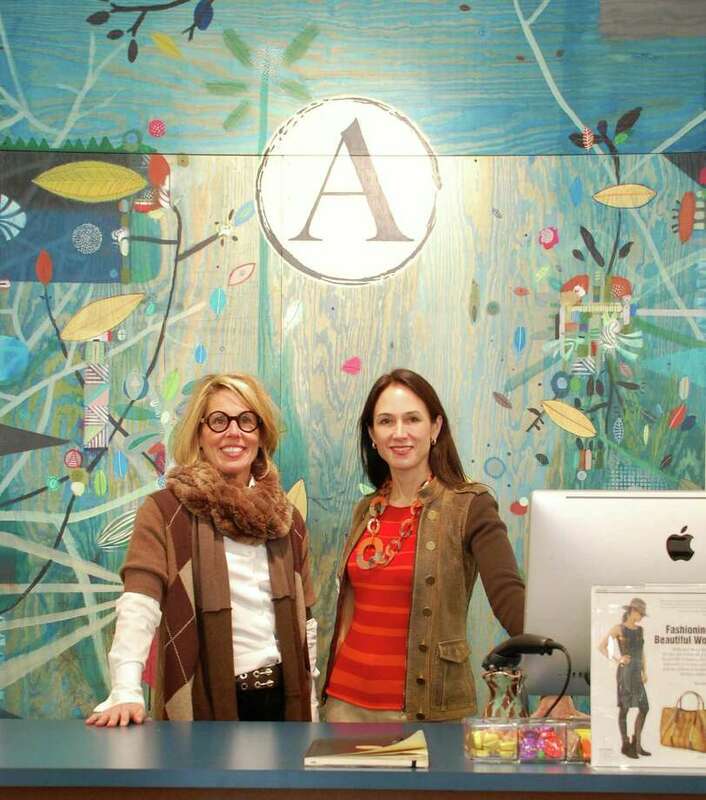 Two New Canaan women, Veronique Lee and Liz Logie, opened their shop on Nov. 1 with an idea to sell high-quality products that are, in most cases, hand-crafted by true artisans from around the world, but in a fashion conducive with the values they espouse. While everything they offer is exclusive and, in some cases, one-of-a-kind, Logie and Lee want to see each product have some combination of being handmade by artisans, organic, repurposed, or made in the U.S.A.
"Most of them satisfy multiple points," said Logie, "but all satisfy at least one." The 1,300-square foot space in the middle of fashionable Greenwich Avenue -- with a high vintage, tin, patterned ceiling -- is busy with unique articles of all variety, such as jewelry, shoes, handbags, dresses, pants, tops, and even a small selection of men's clothes. Upon closer examination, the wares from each vendor reveal a distinctly unique assemblage of characteristics -- from hand-embroidered jackets by members of Afghan tribes, to delicate finery crafted by hand in Cambodia, and beautiful, elegant lady's shoes created in India from both vintage fabric and recycled material. Both Lee and Logie are quick to point out, however, that these are not the products of industrialized sweatshops. On the contrary, Atelier360 stocks products from vendors who in some way subscribe to the principles of what might be called "sustainable clothing." "Every product here has a story behind it, (but) it has to be beautiful first and foremost," Lee said. They emphasized that Atelier360 was not a forum for local hand-crafted goods made by amateurs. On the contrary, examples of some of the finest traditional clothing from around the world are on display, made by individuals who practice some age-old methods of clothes making. The French word "Atelier," while it's often translated as "workshop," Lee said is "really a profession" involving skilled craftsman, and has no comparable English word. She said in France there are artisan awards, where people who have the unique skills of these clothes designers, are honored. "We want to bring out that value (with) things we have here," she said. "I noticed the craftsmanship instantly, not only in the clothing, but the jewelry, belts, etcetera," said Elaine Whitmire of South Salem, N.Y. "(It's) very well-made. "I (also) appreciate empowering designers from around the globe," she said. "The use of organic products, and being handmade so that there is a personal touch, very much appeals to me ... I also want my clothing to not be in stores in every town and city in America." Being in her 50s, Whitmire said she "loves that it is a shop that offers beautifully made pieces that cater to women of all ages, not just children ... To find beautiful clothing that appeals to a woman in her fifties without looking frumpy is a challenge." "Our products are chosen for their quality, beauty and positive impact," reads the store philosophy. Atelier360 also takes part in One Percent for the Planet, which donates that portion of sales to environment causes. "It just sort of goes with our whole mission," Logie said. "Many designers give back in a very formalized way like that. We just wanted to put our money where our mouth is." Atelier360, 113 Greenwich Ave., Greenwich, is open from 10 a.m. to 6 p.m. Monday through Saturday and from noon to 5 p.m. on Sunday. For information, call 203-717-1055 or visit atelier360.com.